If you don’t get the reference, you need to bone up on your MST3K. But squeaky Kathy Ireland impressions notwithstanding, any Ironman is hard. You train, you plan, you envisage how the event is going to unfold – then the race throws you curve balls. The 2012 Ironman St. George was an epic curve ball. I had trained hard for the event, in particular on the bike. I’m a decent runner but a mediocre cyclist and an even more mediocre swimmer. With limited training time available, it made sense to me to focus on the bike – you spend about 50% of your IM race on the bike, so there are bigger time gains to be made there than in the swim, and those gains extend to the run if the bike also takes less out of you. Most of my workouts were in my fitness studio, aka my garage, on my PR-setting Specialized Transition mounted on a Kurt Kinetic Rock and Roll Trainer (I found the additional core-stabilizing compensation of the side-to-side movement of the trainer to be beneficial). (Lest the reader think this is product placement, I have no financial interest in nor did I receive free product from either Specialized or Kurt Kinetic – though they are welcome to contact me. I can be bought. :-)) I did ride outdoors occasionally when the weather was good, but to my old school coach’s dismay (and to Spinervals’ Coach Troy’s financial benefit), I was equally happy to crank out hour after hour on the trainer. All training progress was monitored on TrainingPeaks, who is my sponsor this year. For data geeks, I progressed steadily to a CTL of just over 80 (low for those hoping to qualify for Kona, I know, but the best I could reasonably manage with work, travel, life, etc. ), and had a number of ATL weeks over 100. My indoor 20-min threshold power ramped up to 261 watts, but I also found I could go about 30 watts higher than that with less effort outdoors. I did the Team Sheeper 110-mile, 10,000-ft-of-climbing Epic Ride averaging 202 watts for just under 7 hours, so I thought a target wattage of 200-210 would be reasonable. My swimming and running were a little suspect – when you ride 5-6 days a week, something has to give. I counted on my running background to see me through, so I only ran 2-3 times per week, and I really had no runs over about 90 minutes. Swims were, well, spotty. I did use my Vasa Ergometer a fair amount, and I did start showing up for masters workouts as the event approached. I had some good test swims in my wetsuit, both in the pool and in open water, and those indicated I could easily hold about 1:30/100y pace for an IM swim – 1:05 or so for 2.4 miles. Race day had other ideas, though. Forecasted to be a good day with highs in the low 80s and 10-mph winds, the race began uneventfully with the usual scrum when the gun went off. I settled into what felt like a good pace and kept from being pummeled by other swimmers. The water was a cool 63F but not bad in the wetsuit. I felt good. Then it hit. Near the first turn buoy, I felt waves washing over me from behind. I thought that a large boat must have passed by. By large, I mean an aircraft carrier. I looked back, and what I saw was just ridiculous. Whitecaps, strong winds, swimmers panicking all around, trying to grab on to kayaks and paddleboards. Chaos. It took a while for me to process what was happening: this race had just turned epic! Swells of 3-4 ft., and unlike ocean swells these came in rapid succession. The hardest part mentally and physically came when I turned onto the 1800m leg back towards the start, heading straight into the teeth of the chop and wind. I found that by breathing to my left I could both avoid a mouthful of water and make somewhat faster progress, so I decided to “just go ahead and do that.” Swim exit came in an all-time personal worst of 1:37:21 – a good 30 minutes worse than I had trained for – but at least the hardest part of my day was over. Or was it? Those same winds kicking up the swell were howling through T1, so it quickly became apparent that the bike was going to be, um, interesting. It took about 20 miles from the Sand Hollow Reservoir towards town to hit the first of the two main bike loops, and then came the endless climb through the canyon being buffeted by howling winds. Progress was slow but steady; I was averaging a little over 200 watts but only 15 mph (vs normal 20-21), so the effort was honest but controlled. My equipment mistake was riding a Zipp 808 Firecrest front wheel – it may not be as susceptible to crosswinds as other similarly deep-rimmed wheels, but I was definitely getting blown all over the place, just as I was on the climb to Hawi in Kona 2011. I didn’t feel bad, and I was keeping up with my fluids and nutrition well. Just because an Ironman is hard isn’t a reason to give up, I told myself – they’re supposed to be hard. 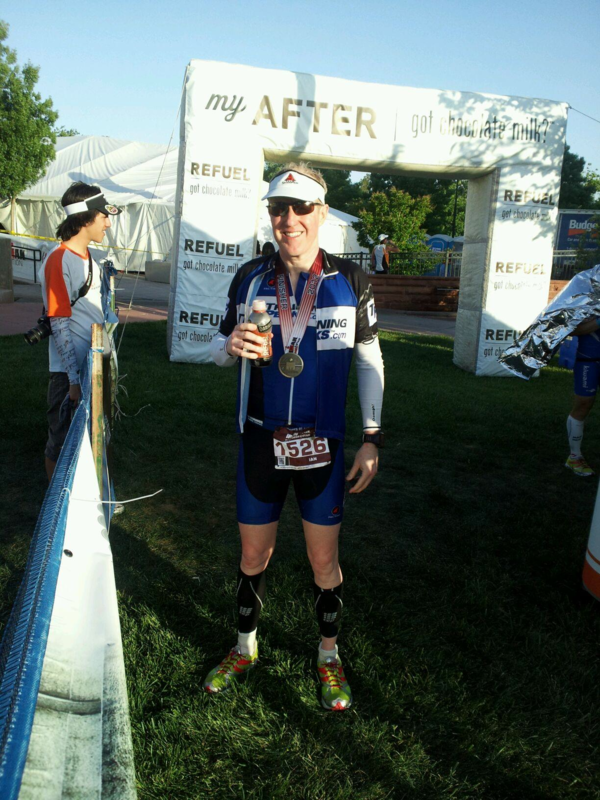 Going into the race, I had ten Ironman finishes, none of them over 12 hours. It became pretty clear that unless I could crank out a 3:30-3:35 run, I was going to go over 12 hours on this day. I asked myself whether I wanted ten finishes under 12 hours and a DNF, or 11 finishes. This was my first race in TrainingPeaks kit, and I didn’t want to disappoint the TP guys. But the bigger reason was my personal cheering section: my friend Greg and his daughter Alexa, who had traveled all the way out from San Francisco to support me. They had been at my disastrous Big Kahuna last fall, where I crashed on the bike and ended up in the ER. I couldn’t let Alexa go 0-2 on my races. The situation improved considerably once I reached the top of the climb and began heading down the screaming, tailwind-driven descent back into town. 18 miles or so of 30-40 mph does wonders for your average speed as well as allows somewhat of a recovery. Things were looking up, so I embarked on the second loop mentally rejuvenated. Now I was finally in my element, or at least I would have been under normal circumstances. The numbers tell the story: apparently, the “magic number” on the Ironman bike is a TSS of 280 in order to be able to run well (my past few have been around 300, which is close enough); my TrainingPeaks file shows a TSS of 413 for St. George. Not that I knew that at the time, but it’s a simple consequence of riding my planned power output, but for 70 minutes longer than planned due to the extreme conditions. After mile 1, I caught up to my teammate and training partner Jess Smith, who is normally extremely upbeat and positive but was not having a good day. Still, she was a loop (8.7 miles) ahead of me. I was running crazily fast on the slight downhills – sub 7:00 pace early on, which was just stupid. I quickly reined myself in and settled into an 8:00 pace, just aiming for around a 3:30 run. It got progressively more difficult, but I used whatever I could to keep going. Mainly other competitors – the LA Tri Club guy in my age group who had smoked me on the descent into town but whom I had passed in mile 1 and kept putting time on; the male pro named Heath that I had done Epic Camp New Zealand with a few years back who was running around my speed (but a lap ahead); various other people. But the second loop was tough, and my pace was suffering. I finally resorted to taking Coke at the aid stations, and that really started helping – I wish I had done that earlier. 10:00 pace became 9:00 pace, and my new goal became breaking 4 hours for the run, which started looking more and more doable as I clicked off the miles. With a few miles to go, I really started smelling the barn, and kicked it up into a slightly higher gear for a strong finish. I made the last downhill mile an all-out charge for the finish, pumping my fists in a celebratory sprint to the line, stopping the clock at 12:18:38 and running 3:53:25, at least keeping my sub 4:00 IM run streak alive. I also notched my best age group finish ever, at 10th in M50-54. Afterwards it became clear just how hard the day had been – a DNF rate of almost 30%, which may be an all-time high in Ironman racing. In light of that, I’m particularly grateful to have found the strength to finish, despite wanting to quit many times during the day. 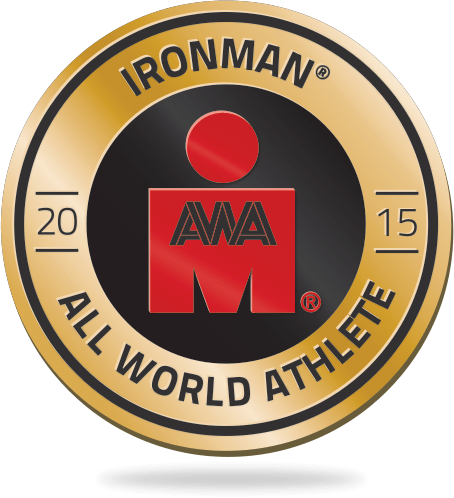 I think I’m proudest of this one, of all of the Ironman races I’ve done and all of the suffering that goes along with them. I will never forget it. Next Post → Ready or not…Hawai’i, here I come! Awesome joB! Congratulations on your accomplishment… That sounds like a killer race! As in no way to be made as a comparison, but while I was in Florida, I went for a swim in the ocean and the combination of waves and salt water, I asked myself how the H*ll anyone could complete an ironman swim in those conditions. Kudo’s to you! In better conditions you probably would have been well below your time goal. Thanks! Yes, swimming in rough water is both scary and different from a technique perspective from swimming in a pool. The slower you are as a swimmer, the harder it is to make forward progress; it definitely helps to practice in some rough open water. Fortunately, I have the San Francisco Bay at my disposal! Great race report!!!! Sounded like a really rough day and I was happy to track you and see you make it through each checkpoint. The next one will feel smooth by comparison, I hope! I’d like to just be able to run a sub 4 hour marathon again none the less be able to do it after that kind of swim and run. great job. GREAT freaking read Ian! Just an incredible effort on your part to make it through what sounds like a brutal day on an even tougher course. Congrats on your finish, your place, and for making it through healthy and happy. BTW – always great to read successes of a local dude (I’m from SFBay too). Maybe we’ll cross paths in Hawaii in a couple weeks.